29 states, 22 major languages, in 13 different scripts (over 720 dialects), multiple ethnicities, numerous festivals, and one nation: INDIA. No wonder, we can proudly state that no other country is as culturally diverse as ours. On one hand, we have festivals like Durga Puja, Christmas and Eid, the celebration of which involves months of preparation, dedication, creativity, love and faith, quite similar to the Prepared Speeches at Toastmasters. On the other hand, some festivities are to be celebrated by living in the moment, like playing Holi, akin to Table Topics Session in Toastmasters. But the main essence of Indian festivals is to bring together people of different and diverse cultural backgrounds, just as we aim to do at any Toastmasters’ club. 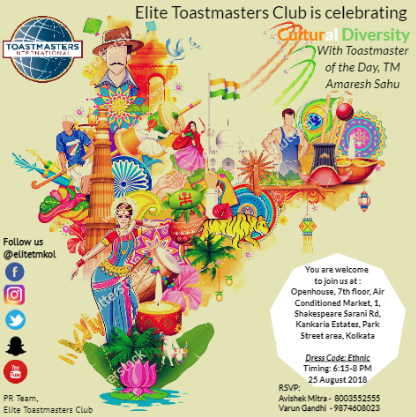 Palpable excitement of the toastmasters and the guests was exhibited through a splash of colours on their ethnic attire, which made the ambience vibrant, at Elite Toastmasters Club, on 25 August’18. The spirit of Toastmasters was evident in their unique ethnic outfits as they poured out their thoughts when the TMOD Amaresh Sahu, discussed about the culturally diverse population of the country with them.